Drain Solutions are specialist Underground Utility Locator in Melbourne. We use state of the art underground utility locating equipment and techniques to locate conductive underground utilities services like power, water and communications. We are able to quickly and accurately determine what services are underground and where they are located. 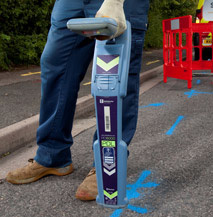 Drains Solutions will mark out the alignment and depth of the service on top of the ground using ground marking paint. This allows the service to be referenced by the contractors on site for further work. We also supply a detailed written report with media to advise you of the utilities located and for future reference of the underground utilities that have been identified. Further, upon request, we can expose, using hydro excavation, non destructive digging (NDD) or vacuum excavation with our hydro vac truck, the exact location of underground service or services to establish safe digging areas. Drain Solutions is a specialist in all areas of utility locating services and damage prevention of underground utilities, with all works carried out in accordance with AS5488-2013 ‘Classification of Subsurface Utility Information’. Drain Solutions has the latest and most up-to-date radio frequency pipe locator and cable locator available to locate underground utilities including domestic water, fire services, gas networks, high voltage and low voltage electrical networks, telecommunications, storm water and sewer assets. In the event that a pipe cannot be traced via standard techniques, such as clay, PVC or concrete, we can trace the conduit or pipe utilising a fibreglass rod, which will carry our locating signal through the pipe. This combined with our hydro vac truck, non destructive digging (NDD) & potholing techniques enable us to offer the most accurate and reliable underground utility locating facility available today to confirm the service location. Both techniques allow the determination of pipe depth and its alignment. As a Telstra Accredited Plant Locator in copper & optic fibre and a Dial Before You Dig Certified Locator, we use electronic transmitting equipment like our cable locator, to trace and locate buried assets, without disruption to actual communication lines. If the conduit has an optic fibre inside, or it is an empty conduit, we can insert a fibreglass rod, which will carry our locating signal through the pipe. This will enable us to use our cable locator to trace the conduit, giving an accurate alignment and depth of the underground asset. For stormwater and sewer drains and pipes, we can use our CCTV push camera for small diameter pipes up to 100 metres in length. Our CCTV Tractor Camera can be used for larger diameter pipes up to 100 metres in length between manholes. Our drain cameras have a sonde fitted to them which transmits a signal allowing our pipe locator to trace this signal, giving an accurate alignment and depth of the underground drain. To locate PVC water pipes we can use our hydro truck to hydro excavate and expose the pipe using the potholing method. This allows visual identification and accurate location and depth of the pipe or asset. Dial Before You Dig is an essential service when locating underground utilities and you must have current Dial Before You Dig plans on site before you begin any earthworks. This is the case for anyone, regardless of whether you are building a major highway or digging a hole in the front yard. Contact us today and let us organise, print and prepare up to date Dial Before You Dig plans for you and bring them to site with us, then locate your underground asset. Dial Before You Dig is a referral service for information on locating underground utilities anywhere in Australia. Locators, Excavators, Electricians, Plumbers, Planners, Developers, Farmers, Land Surveyors, Builders, Contractors, Home Owners and Landscapers all over the country are taking advantage of our convenient referral service. No matter the size of your project, you can be doing landscaping in your backyard or heavy work such as directional boring or directional drilling. Just tell us when and where you plan to dig, we pass that information on to the underground utility owners and they will respond directly to you with the cable and pipe location information. Login or Register to request the information or call 1100 during business hours. Telstra consumer advise is to obtain Dial Before You Dig is the essential first step you must take to ensure any ground breaking activity such as digging is safe and damage free. Any ground breaking activity can cause damage to our underground communications network: even if it’s something as simple as driving in a star picket or digging in your own backyard. But with some simple planning and extra care, you can avoid costly damage to your valuable equipment, as well as ours. The mission of NULCA Australia Inc. is to define, establish and maintain best work practices performed by the underground utility locating industry. To establish work standard and competencies which will assist in providing a safer work environment for the general public, excavators, and all people in the civil works and underground service locating industry. As an Association we will fulfil our mission by partnering with utility companies, excavators, Dial Before You Dig, suppliers, manufacturers and regulatory bodies, as well as other interested parties passionate to provide leadership roles, to assist in the reduction of underground facility and environmental damages. Drain Solutions use Radiodetection Precision Cable Locators – The RD8000 and TX 10 Transmitter which offer the cutting edge of Precision Marker and Cable Locators, with advanced connectivity options and multiple locate functions.